Wooden Wedding Ring For Women : LOVE2HAVE in the UK! 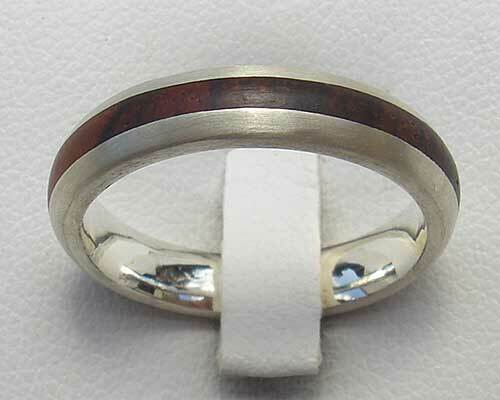 A 4mm width wooden wedding ring for women with a 1.8mm wide orangey red Cocobolo wood inlay. This model is one of the narrowest versions of the domed ranges we sell which would be suitable for a woman. 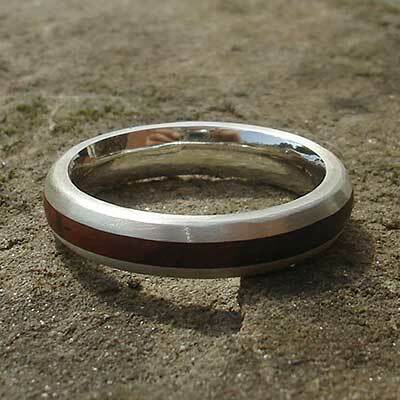 As the wood comes inlaid into the silver, the silver protects the wood from wearing away, unlike a wooden ring made entirely from wood only. We have chosen Cocobolo for its lovely dark reds and browns allowing more contrast with the silver, something that women will appreciate. Our wood inlay rings are all handmade. They have a very organic look to them so are of great interest to customers looking for something contemporary with a natural, earthy or spiritual design style. These rings will appeal to couples looking for unique wedding rings. We often get asked about the durability of the woods in these rings. The wood is a hardwood, but it does alter over time and become darker. It is tough and stands up to wear and tear very well. Other widths are also available if you require a matching set, for example, so please email us for further details. The fitting of it is a comfort one, meaning it is slightly curved and glides nicely onto the finger. The silver is matte in finish, and the inner is polished and therefore very comfortable. When purchased together with the wider version they make a very unusual wedding ring set, and the silver is nicely finished to match the wider version. 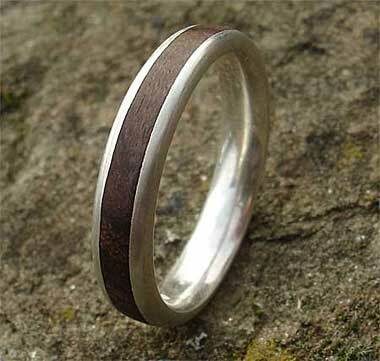 A lovely ring with a wooden inlay and your first choice for a wooden wedding ring.